Recently ordained to the priesthood Dom John Tonkin of the Canons Regular of the New Jerusalem will be returning home to celebrate his first local Mass next Sunday, January 10 at 2:00 PM at St. Alphonsus Church in Windsor. It will be a Solemn High Mass with Deacon and Subdeacon. Prior to entering religious life, Dom John was for many years an altar server for the Windsor Latin Mass. All are invited to a reception for Dom John to be held after Mass in the St. Alphonsus Social Hall. For the second year in a row, Fr. Scott Thibodeau of Our Lady Queen of Martyrs Church in Beverly Hills, Michigan has offered the use of his church for a special Tridentine High Mass for the Feast of the Epiphany this Wednesday, January 6 at 7:00 PM. Fr. 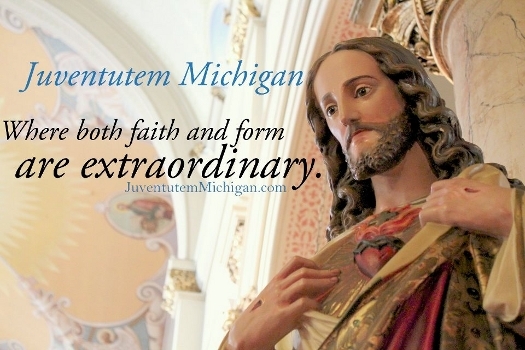 Clint McDonell will be the celebrant, and Oakland County Latin Mass Association volunteers are assisting with the organization of this Mass. Our Lady Queen of Martyrs is in the midst of a restoration of the church which includes the installation of a new High Altar, a new tile floor for the sanctuary, and soon the reinstallation of the Communion Rail. There is a longstanding tradition of blessing chalk, water, and occasionally incense on or near the Feast of the Epiphany. Locally we perform the blessing on the Sunday prior to Epiphany. The European custom is to take the blessed chalk home and use it to write over the door of the house, 20 + C + M + B + 16, where the numbers represent the year, and the letters stand for the names of the Magi: Caspar, Melchior, and Balthasar. 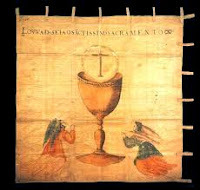 It is a way of dedicating the year and one’s home to our Lord. If blessed incense was also distributed, the door of the house is incensed. “Three Kings Water” is blessed with an elaborate, 25-minute ceremony from the Rituále Románum. The ceremony includes an impressive and unequivocal prayer of exorcism. This prayer is more detailed than the prayers of exorcism used in the blessing of regular Holy Water. The pure and exorcised Epiphany Water is then taken home and sprinkled in the rooms of the house as a protection against evil. The full English translations of the Blessings of Epiphany Chalk and Water were published in our January 3 and January 10, 2010 columns which are available in our column archive at www.detroitlatinmass.org. St. Stanislaus Kostka Church, in the midst of a multi-year restoration, is about to commence the restoration of its High Altar and the (re)installation of a Communion Rail. Marytown’s rector published a letter which is distributed at the entrance to their chapel, explaining that their music program is being changed to incorporate more Gregorian Chant. A new music director with connections to Mundelein Seminary has been hired to implement this new focus. Marytown is also home to occasional Tridentine Masses, entirely appropriate for the main chapel and the perfectly proportioned and preserved side chapel [shown in photo below]. 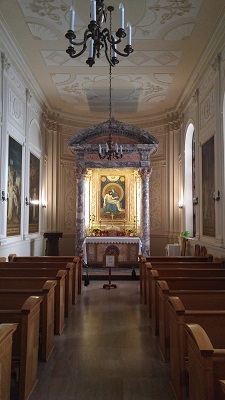 Mundelein Seminary has (re)installed a High Altar with centrally-located tabernacle in the sanctuary of their main chapel. Mundelein hosts a number of Holy Masses in the Extraordinary Form each year, so there is a practical benefit to having this particular architectural feature restored. Tue. 01/10 2:00 PM: Solemn High Mass at St. Alphonsus, Windsor (The Holy Family) – First local Mass of Dom John Tonkin, CRNJ. Reception after Mass in the social hall.